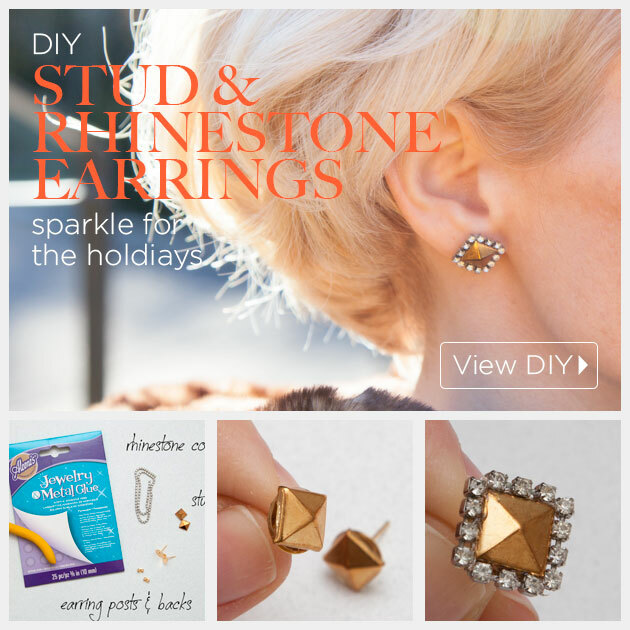 Add some sparkle to studs with this Stud and Rhinestone Earrings DIY. 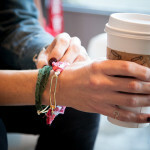 Be edgy and sparkly all at the same time! 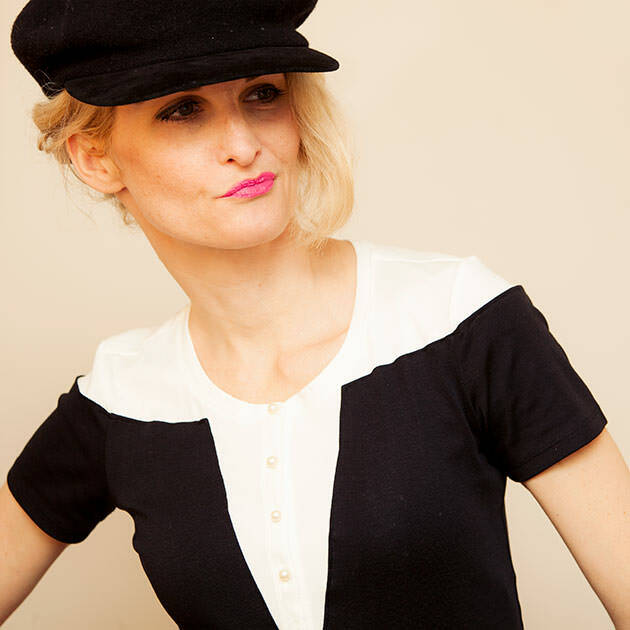 Make sure your pyramid studs have flat backs. 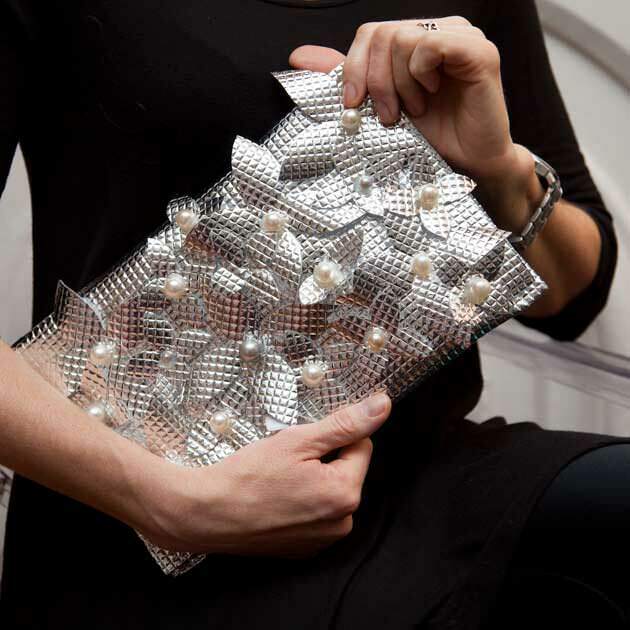 You can either buy them this way or if you have the kind with the prongs you can fold them under as in the picture. 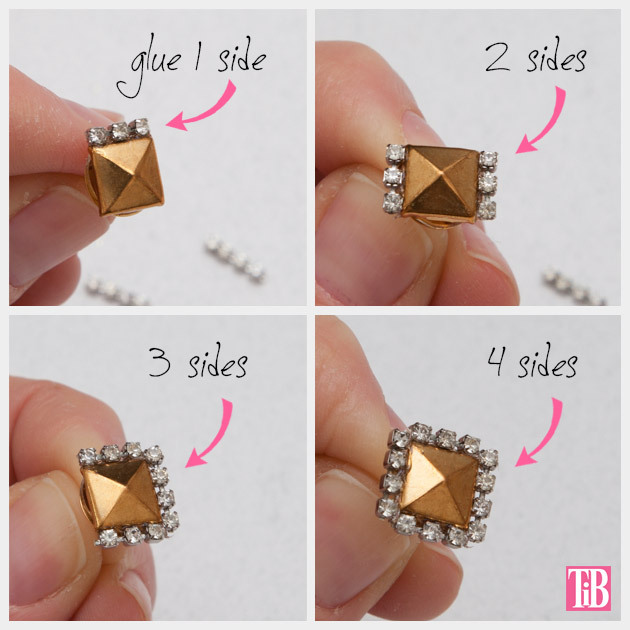 Add one glue dot to each of your earring posts. You can just glue your studs to your earring posts, however the glue dots help to add a little more stability for your rhinestone cord. 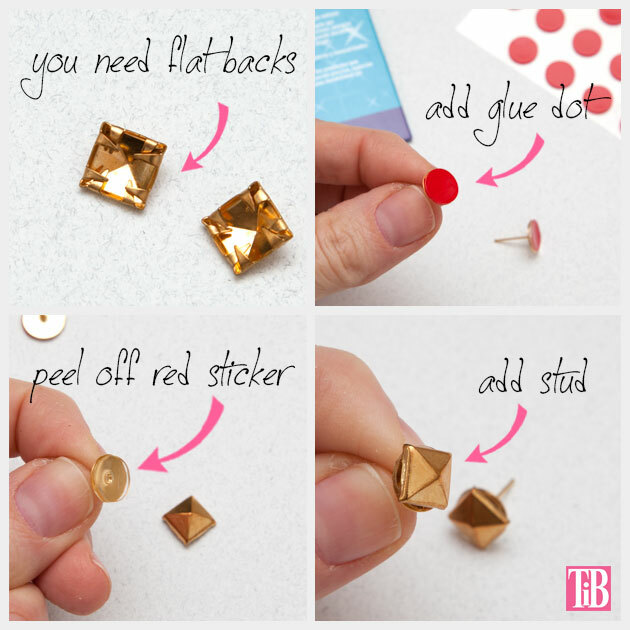 Place the glue dot on your earring post and then peel the red sticker off when you are ready to add your stud. Press your stud into your glue dot to secure it. 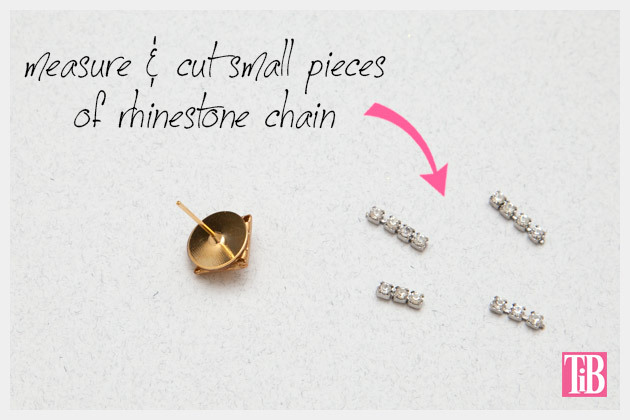 Using your wire cutters, cut your rhinestone chain. Based on the size of my rhinestone cord I cut 2 pieces 3 rhinestones long and 2 pieces 4 rhinestones long, for each earring. Be sure to measure your rhinestone cord with your studs before cutting. 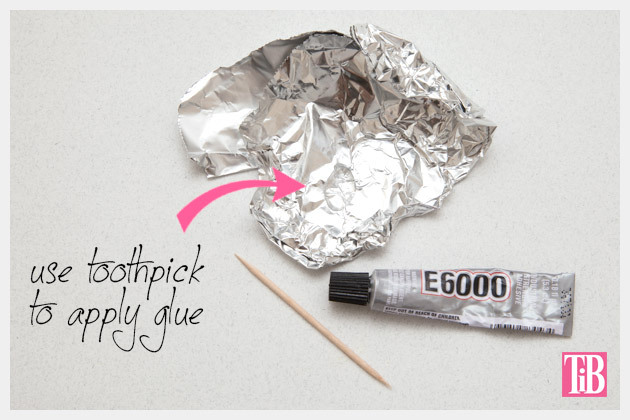 Place a small amount of glue on a piece of foil and using your toothpick add your glue to the side of your pyramid stud and press your rhinestone cord into the glue and let dry. I recommend adding your 2 smaller lengths of rhinestone cord first and then adding the longer pieces second to cover the ends. These earrings are super quick to make, you can definitely make a pair to wear to your next holiday party or to give as a gift. 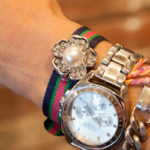 Because they use such a small amount of rhinestone cord you can use your leftovers from other DIY’s or buy new and make several pairs for everyone on your gift list! 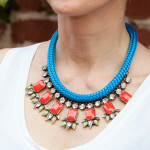 So easy and gorgeous, Cathy! 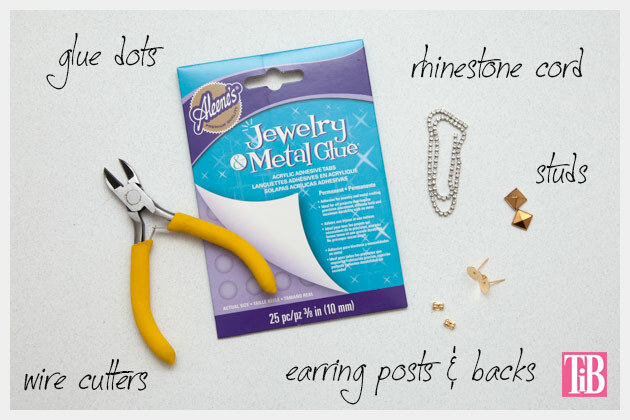 I love these jewelry glue dots, I’ve never heard of them yet they seem like a must-have! Thanks Lia! Yes, these glue dots are awesome!!! !